Chemists have discovered that tiny particulate matter called aerosols lofted into the atmosphere by sea spray and the bursting of bubbles at the ocean’s surface are chemically altered by the presence of biological activity. Their finding, published in this week’s issue of the journal Chem, is a critical discovery that should improve the accuracy of future atmospheric and climate models. 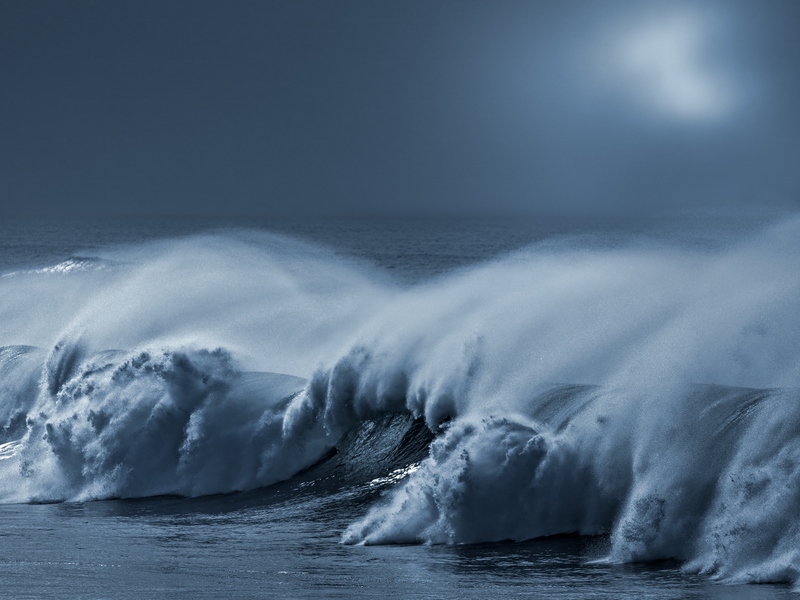 The scientists noted in a paper detailing their results that one of the key factors in developing more accurate climate models is a better understanding of the chemical composition and diversity of sea spray aerosol particles. “We wanted to understand their climate properties, including ‘hygroscopicity’—the ability to take up water, increase their size as a function of relative humidity and to form clouds,” said Grassian, who holds the Distinguished Chair of Physical Chemistry in the Department of Chemistry and Biochemistry and is an associate dean in UC San Diego’s Division of Physical Sciences. She is also a Distinguished Professor in the Department of Nanoengineering and at Scripps Institution of Oceanography. By increasing humidity and lofting particles into the atmosphere that can either reflect sunlight during the daylight hours or limit heat loss at night, sea spray aerosols as well as mineral dust are believed to have a major contributing effect on climate. To determine how biological activity impacted sea spray aerosols, scientists at UC San Diego’s Center for Aerosol Impacts on Climate and the Environment, including Kimberly Prather, the director of the center, a professor of chemistry and biochemistry and the Distinguished Chair in Atmospheric Chemistry, used a unique wave flume facility located at Scripps Institution of Oceanography that allowed them to analyze the molecular composition of individual sea spray aerosol particles during different stages of a phytoplankton bloom. High-resolution mass spectrometry experiments at the Pacific Northwest National Laboratory also enabled the researchers to determine the major classes of organic molecules that make up the sea spray aerosol molecules as the biological conditions changed during the simulated phytoplankton bloom. Other coauthors of the study were (from UC San Diego) Richard Cochran, Jonathan Trueblood, Armando D. Estillore, Camille M. Sultana, Christopher Lee and Kimberly Prather; (from University of Iowa) Olga Laskina, Holly Morris, Thilina Jayarathne, Jacqueline Dowling, Alexi Tivanski, Zhen Qin and Elizabeth Stone; Pacific Northwest National Laboratory scientists Peng Lin, Julia Laskin and Alexander Laskin; UC Davis scientist Christopher Cappa; and Timothy Bertram of the University of Wisconsin-Madison. The study was funded by a grant from the National Science Foundation through the Center for Aerosol Impacts on Climate and the Environment (CHE 1305427).